About this time last year, we launched Muddy Boots Plant Tags, a new “smart” plant tag integrated with a web-based garden record-keeping system. 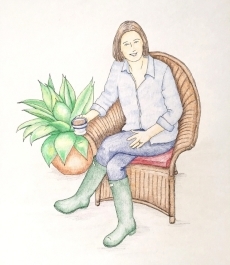 Our original tags had a QR Code marked on them, but were not customized with individual plant names. 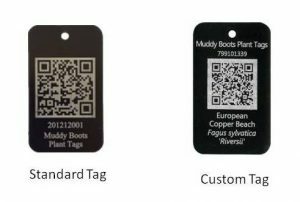 We heard from many of you that you liked the concept and the system, but the tags really needed to carry plant names as well as the QR Code that links to the online system. So, we would like to introduce our new Custom Tag offering. Our Custom Tags come in three sizes: Small, Medium, and Large. We still offer our Standard Tags which are generic, and may be assigned to your plants and re-assigned if, for instance, the plant dies. The Standard Tags are useful for labeling annual plantings, containers and even vegetables.